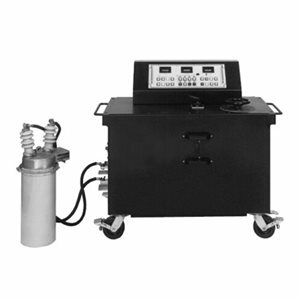 Model OCR-8015 and Model OCR-9150 Automatic Oil Circuit Recloser Test Sets are self-contained mobile test sets specifically designed to verify the proper operation of automatic circuit reclosers under simulated overload and fault conditions. This ensures reliable system protection and coordination. Microprocessor-based control and instrumentation systems ensure simple operation with precise test results. Model OCR-8015 and Model OCR-9150 provide a variable high-current output with an impedance compensation network to stabilize the output current. They include appropriate instrumentation and control circuitry to efficiently, accurately and safely test virtually all single-phase and three-phase direct-acting reclosers produced by manufacturers such as Cooper Power Systems, Inc., McGraw-Edison (Kyle, Line Material), Westinghouse, General Electric, Kearney, and Lexington Switch and Controls.